If you are trying to decide what to pack for your next trip hiking Cades Cove, look no further. 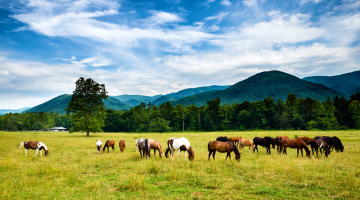 We’ve created a list of 5 essential things you need for hiking Cades Cove. A container for water is the absolute number one most important item you need to bring. You have to stay hydrated while you are hiking Cades Cove or really anywhere for that matter. Wrap duct tape around a water bottle to make sure it doesn’t leak while you are traveling and remember to have enough water to last throughout the day. Pro Tip: Invest in a collapsible water bottle that you can refill if you are going on long strenuous hikes. Never drink untreated water. You can purchase a bottle that comes with a filter or purifier if you need to refill from a natural water source. Bring along some no-cook items that will be easy to store in your backpack. They should also be items that have long storage times like jerky, dried fruits, trail mix, etc. These snacks will be good to munch on when you feel low on energy or you are trying to stay warm. The process of digesting food actually helps keep your body temperature warm. Pro Tip: Pack at least an extra day’s worth of food to ensure you will have enough energy throughout hiking Cades Cove. Having the right hiking shoes is going to make your hike much more enjoyable. You won’t have to worry about achy feet, and you’ll be able to navigate through rough terrain. Pro Tip: Invest in a pair of hiking shoes that will last you a long time. They might be expensive at first, but it’ll save you money in the long run if you don’t have to replace them often. Pack a compass, map or even have a GPS with you while hiking Cades Cove. Learn how to read a map, so you can use that as a backup in case you stray from the trail’s footpath. Pro Tip: Bring extra batteries for your GPS if you choose that as a navigation tool. You can even bring all three items if it helps you feel more prepared. Weather in Cades Cove can change very quickly and varies from season to season. That’s why it’s important to wear quick-dry clothing when hiking Cades Cove. Quick dry clothing is helpful if there’s a light rain shower, but it’s also great for any time you may encounter water in the national park – you’ll dry quickly, making your hiking experience even better. Pro Tip: Avoid cotton clothing when you are hiking because it tends to hold in moisture. For more information on hiking Cades Cove, check out this blog post on Cades Cove hiking trails.